- Styrene by Plaskolite is the brand I use. 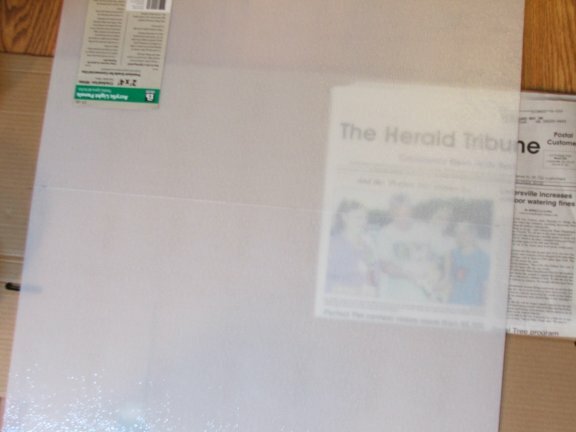 Do not use the clear panels. 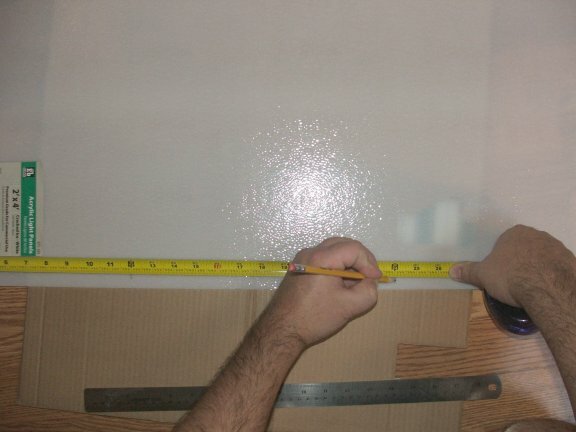 Please look at the diagram for how to measure and mark the panel for cutting. 1. 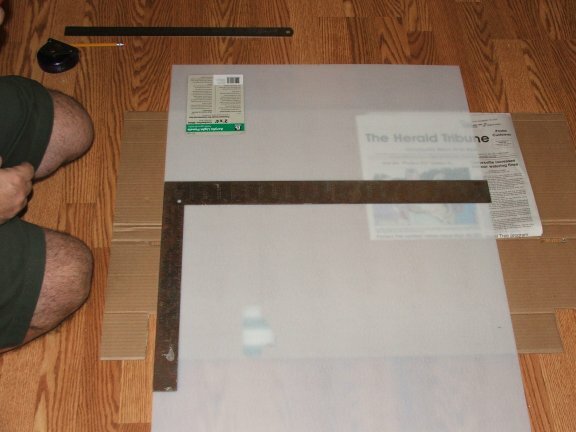 Before you begin, measure out the sheet at 12 inches, 24 inches and 36 inches. When measuring make sure you always start from the same edge. 2. Now you will need to get ready to score the first line. Only score on the smooth side of the panel. Use even pressure, you are not trying to cut through with the first score. You will have to make 4 scores. Repeat scoring depends on how much pressure you apply. 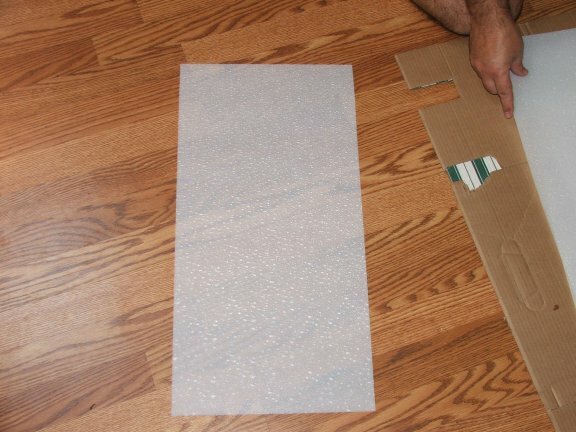 You must place thick layers of cardboard and newspaper under your panel, so not to cut your floor. Even with protection, be careful while you are cutting, you do not want to cut all the way through. Make sure to keep fingers and hands back, be careful while cutting. 3. Making the first cut. You will make 4 passes (depending on how much pressure you apply) and on the fourth cut you will hear that the sheet sounds ï¿½crunchyï¿½ and it will be harder to score on this pass. 4. You can see in the picture the score line. This score did not cut all the way through. 5. You will need a straight edge ruler to hold the score line as you prepare to bend the score line. 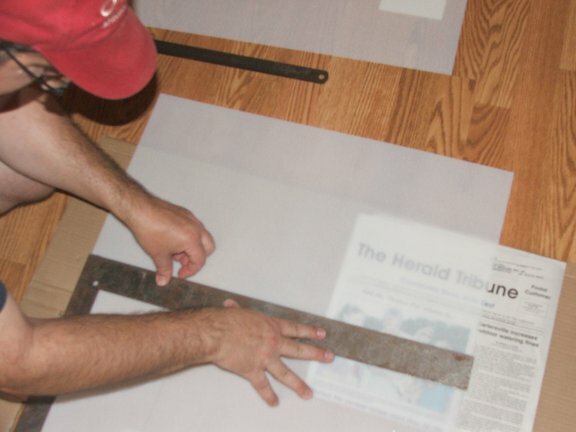 This is where the framing square came in handy but any metal ruler that is large should work. If you donï¿½t have anything like that you can use any strong item that is straight. Just make sure it is wide enough to keep your fingers out of the way. To bend you must turn the panel over and bend with rough side up. This should not take much pressure. If it is hard to bend, turn back over to the smooth side and score again. 6. This image will show you the panel bent all the way. 7. Shows the panel now cut. 8. To prepare for the next cut, make sure to turn the panel over to the smooth side. Repeat this process till you have all the sheets in the next set of pictures. 9. Now you should have 3 (three) panels that are the correct size for the next steps. 10. You will notice that you have one panel left. 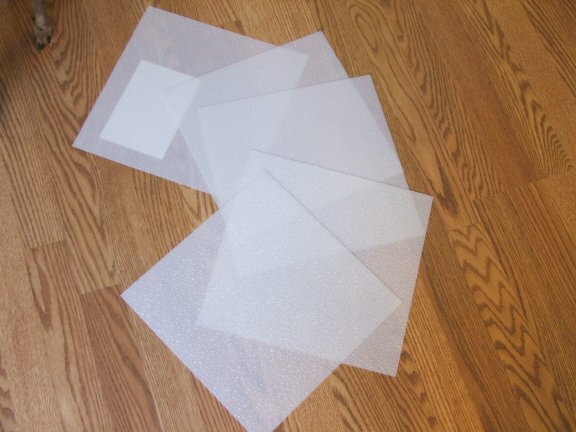 Make sure to remove this one from your pile as this sheet is going to be the wrong size and should not be used. 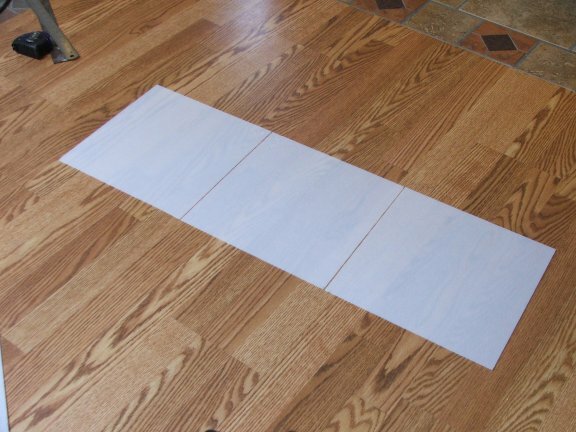 The 2 x4 sheet was not actually 2 X 4 and that is why this last sheet should not be used. 11. Now it's time to measure the three smaller panels for cutting. Look at diagram for how to measure and mark for scoring. 12. Measuring each panel in half. Look at the diagram again if you want to make sure of the measurement. 11 7/8 inches is half. 13. Scoring begins. Only score on the smooth side of the panel. Again, score 4 times, depending on the pressure you apply and on the forth time the panel will start to sound ï¿½crunchyï¿½ on that fourth cut. It will also be harder to make a pass on the fourth cut. You will need a straight edge to hold the score line as you prepare to and bend the score line. 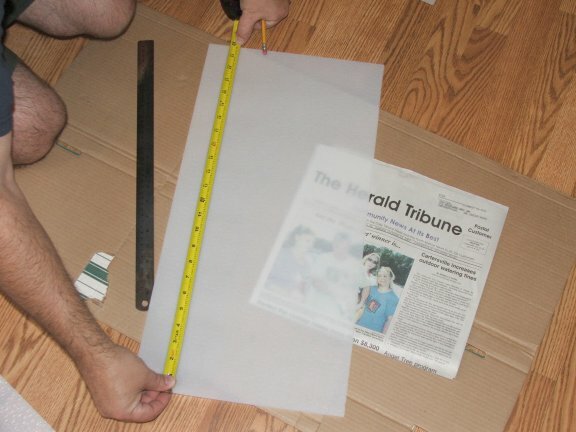 This is where the framing square came in handy but any metal ruler that is big should work. If you donï¿½t have anything like that you can use any strong item that is straight. Just make sure it is wide enough to keep you fingers out of the way. Iï¿½m going to put this in all caps because it is important. 14. To bend you must turn the panel over and bend with rough side up. This should not take much pressure. If it is hard to bend, turn back over to the smooth side and score again. Shows the panel breaking in half. 15. Panel broken in half. 16. Again, you will have extra pieces left over after these cuts. 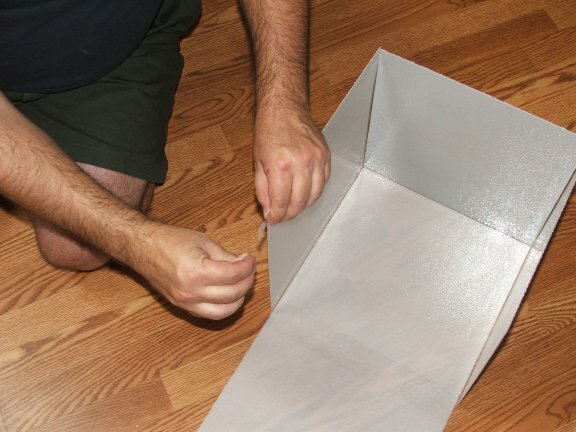 You will not need them for the light box, so it's a good idea to keep these in case you break your box and need to replace a section. 17. Shows your completed panels. 18. Layout your panels as shown in the image. 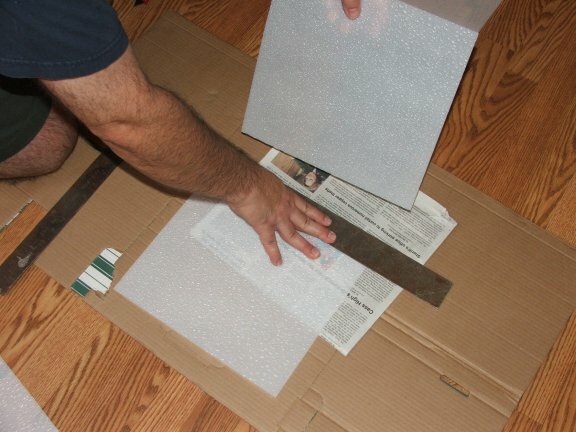 Make sure at this point, that you have the smooth side of the panels facing up (these will be the inside of your box) also take a few moments to look at the inside edges of your squares, where all the points touch the center square and make sure you line them up perfectly. They should all touch each other without some being larger on the corners than others. All the points should touch. Due to the fact that most people wanted their boxes to come apart we taped this one together. 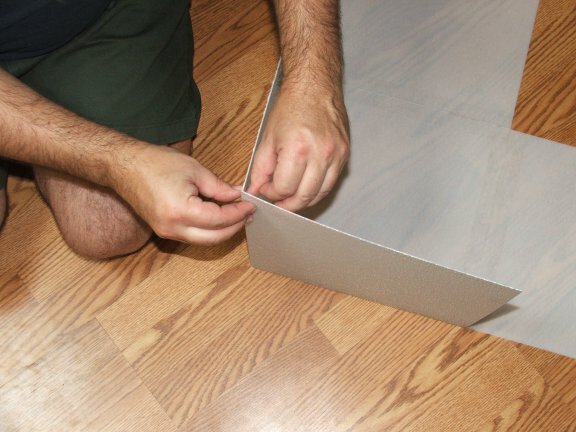 If you donï¿½t want your box to come apart, you will need another person to help you to hold the panels together while you glue your panels. Make sure your glue is clear, strong and bonds fast. 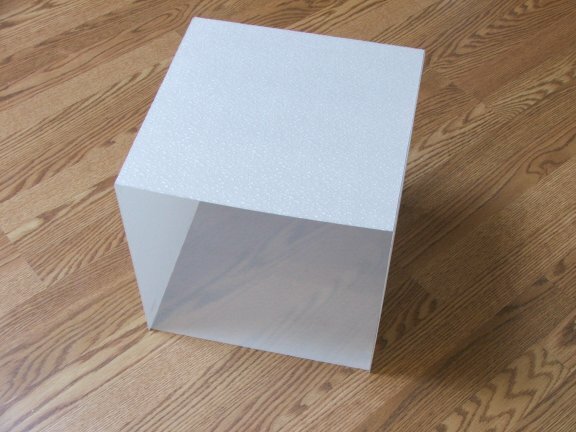 This box is not the strongest thing in the world so if you have a brainstorm and find a way that works better for you, definitely do it. Leave no gaps between your squares. 19. 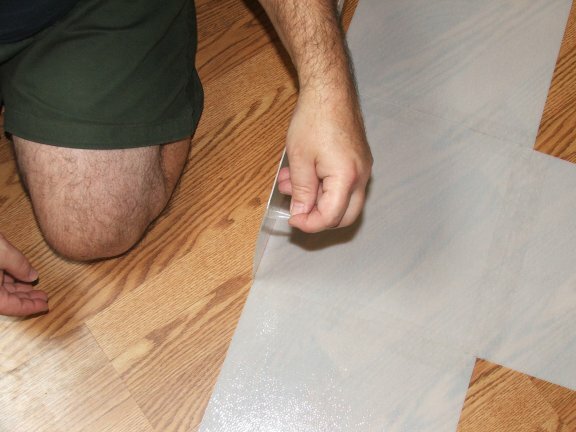 This step shows how you will need to begin taping. 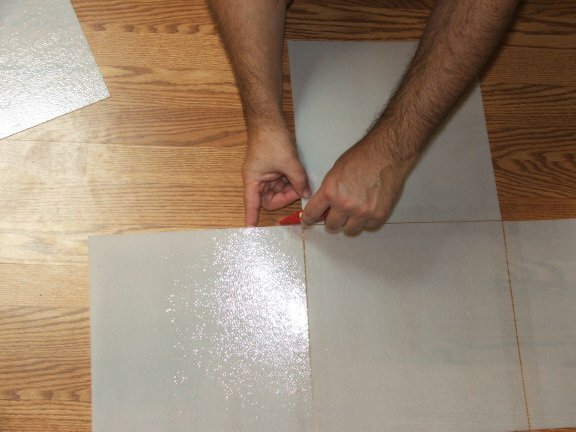 Use three (3) panels first and tape the smooth side only. 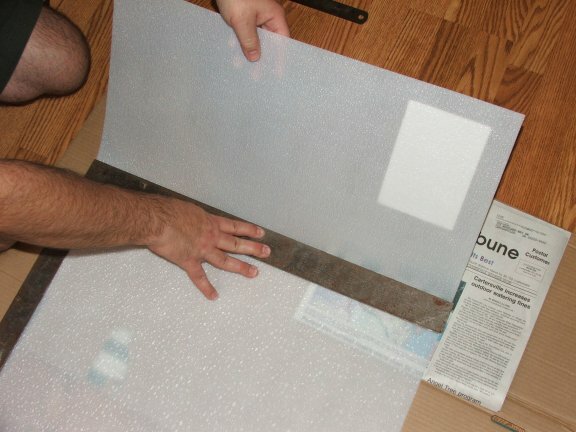 Tape will not stick to the rough side of the panels. 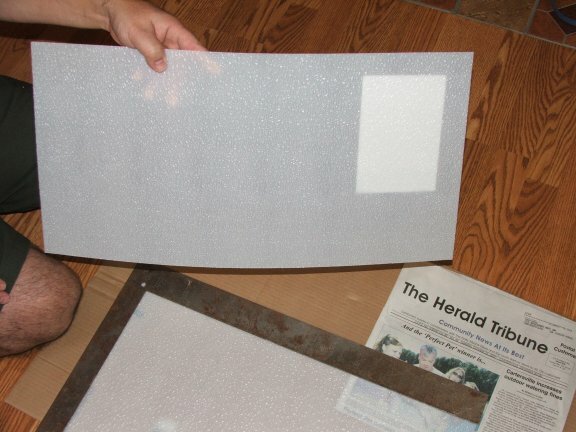 Repeat this process till your first three (3) panels are taped. 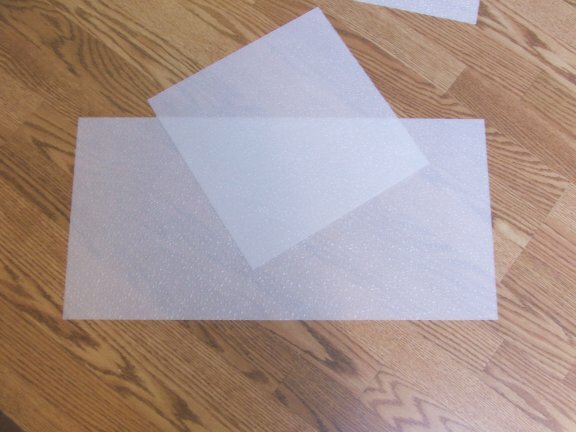 After they are taped, line up the next two, making sure of your edges and that you have the smooth side up. 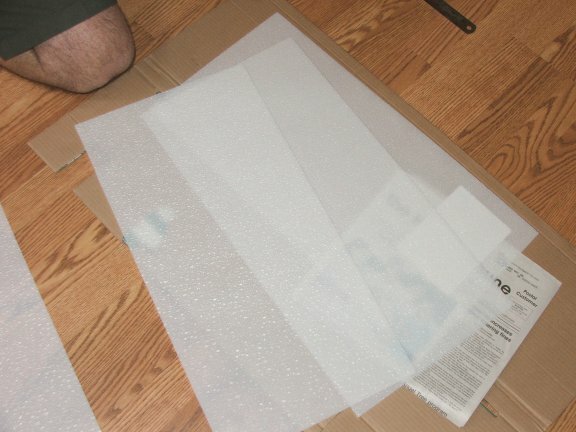 Tape them in place just like you did with the others. 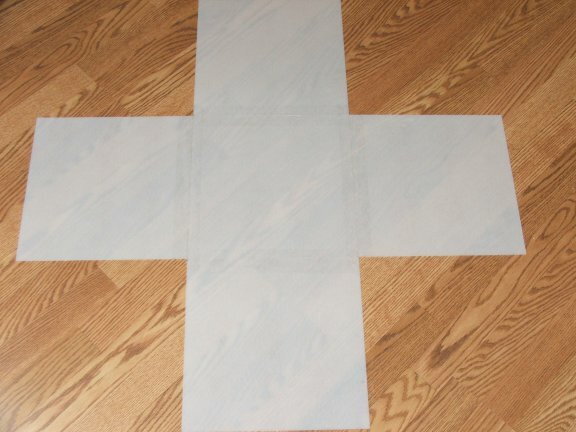 After you have taped your three (3) panels go ahead and tape the last two (2) to make your cross. 20. 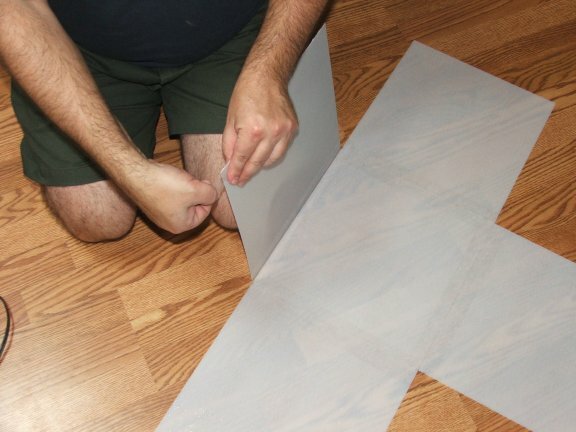 You will have excess tape trim on the corners of the panels after you've applied the tape and will need to remove the excess. 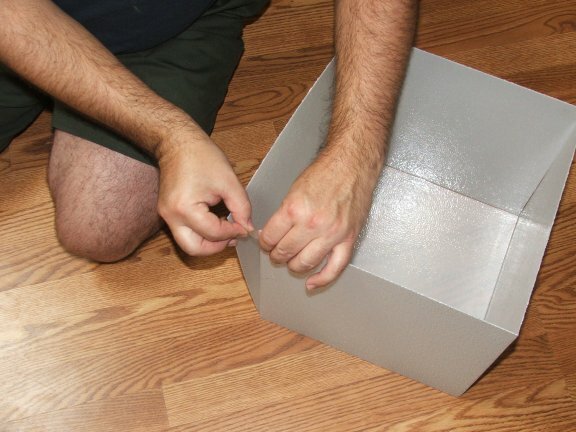 Please note the gaps in the pictures are only for this demonstration and your box should not have any gaps. 21. 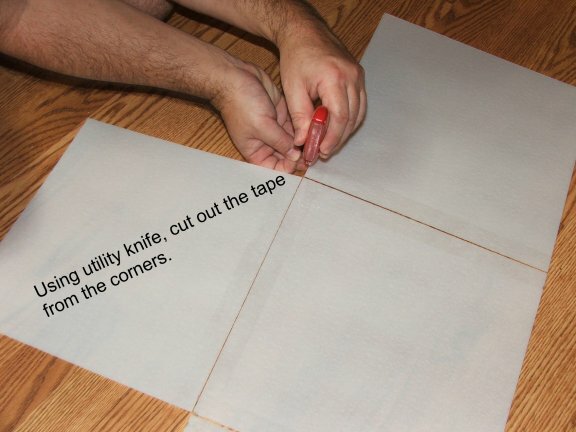 Use your utility knife to trim the extra tape out of the corners, to allow the panel to fold up. 22. Press down your tape to make sure you have good contact. 23. 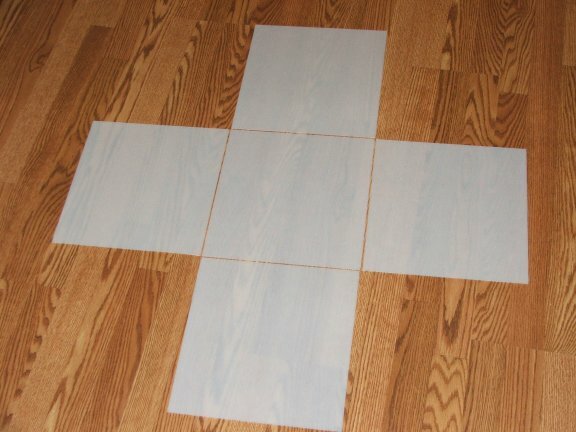 Now you should have a finished cross with no gaps between squares. 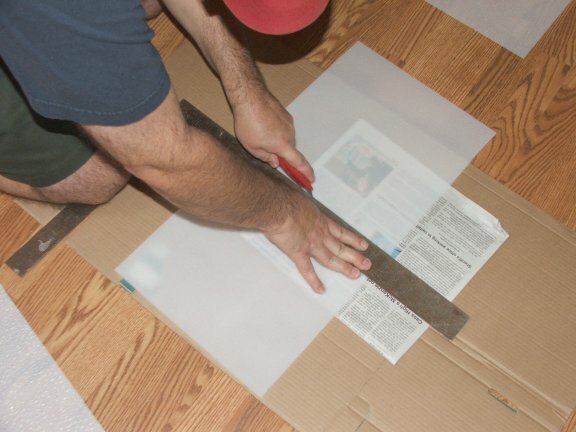 At this stage, your panels should only be taped on the inside of the box. 24. Now your box is almost done. 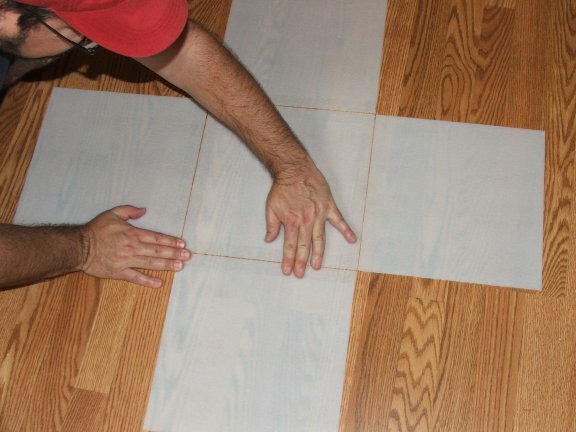 Start by taking one square and fold up, as shown in the picture. 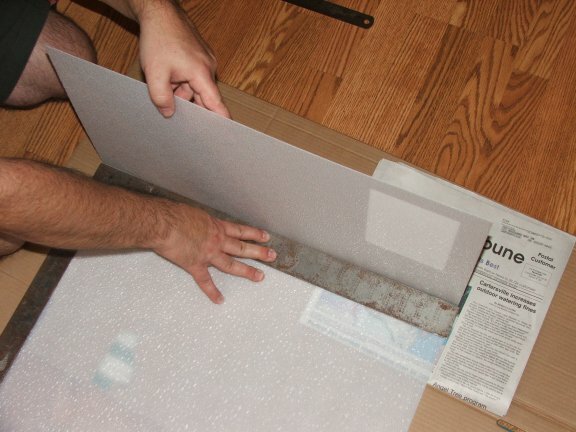 Apply a small strip of tape to the corner edge. 25. 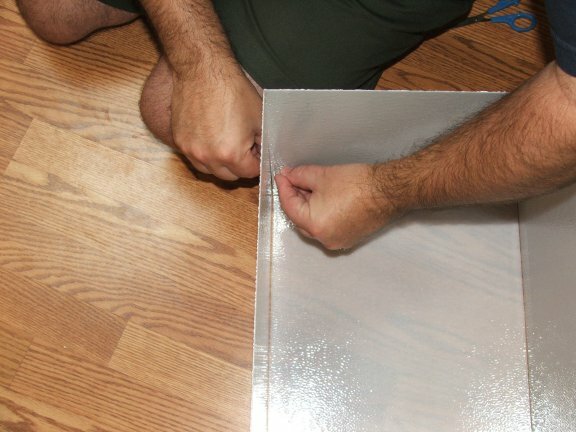 Where to apply the tape on the corner of the first panel. 26. After folding up the second square, join the corners. 27. 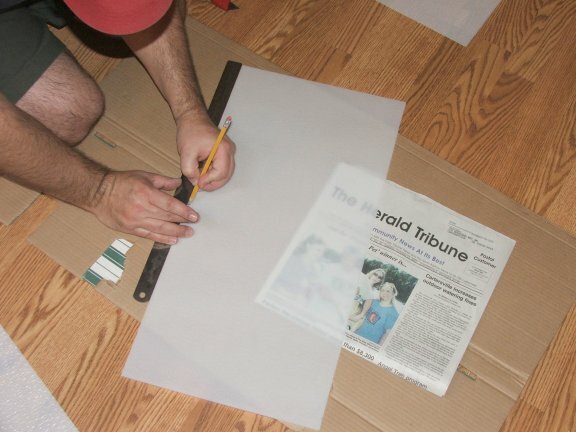 Taping the third corner. 28. 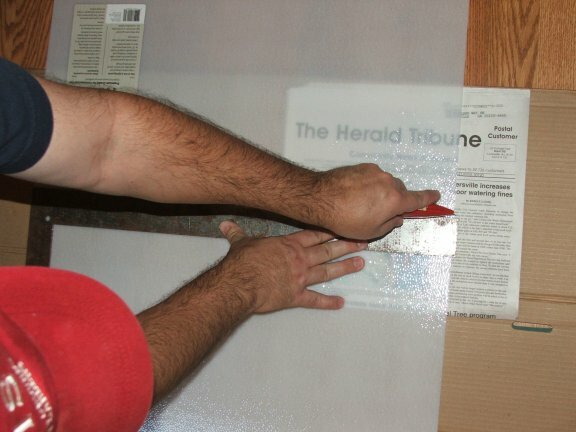 Taping the fourth or final corner. 29. Now we are going to use the next 4 strips of tape to close the gap in the middle of the panel walls. 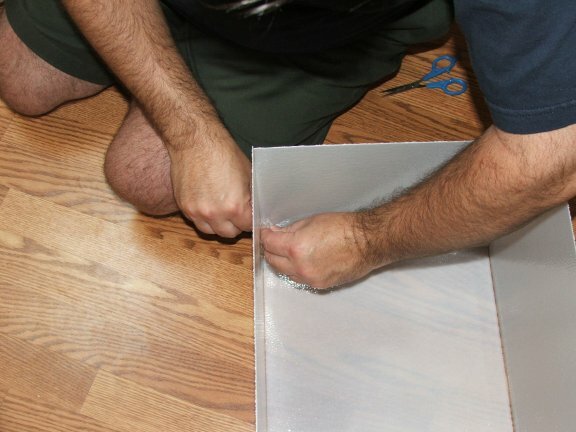 You will need to pinch the outside of the cube with one hand, while applying the tape on the inside of the cube with the other hand. 30. Continuing to tape each side. 31. Now you have a completed Photo Box. Now it's time to have fun and make great pictures of your miniatures. 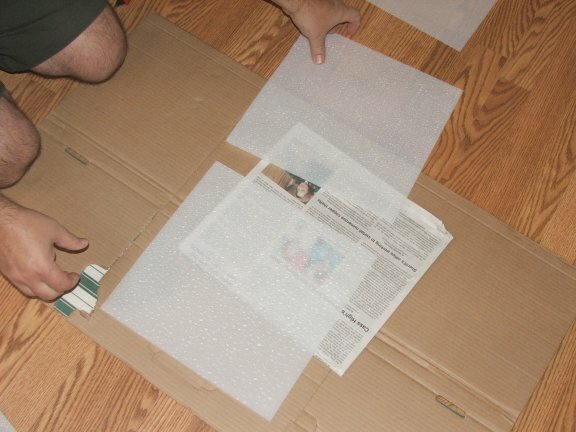 You can fold the box up, but occasionally the tape pops off; just replace the tape as needed. 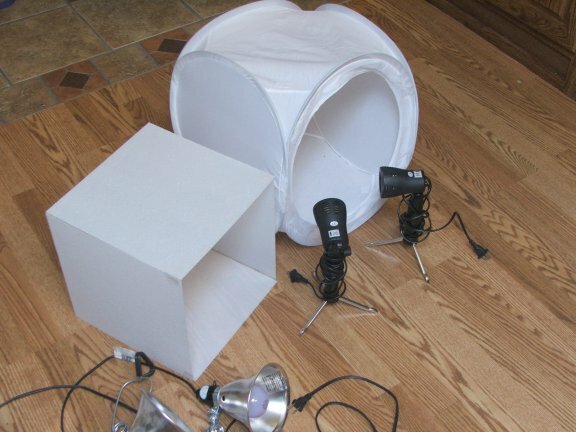 The lights that I have recommended in the homemade box diffuses light better then the white fabric of the store bought box. 33. 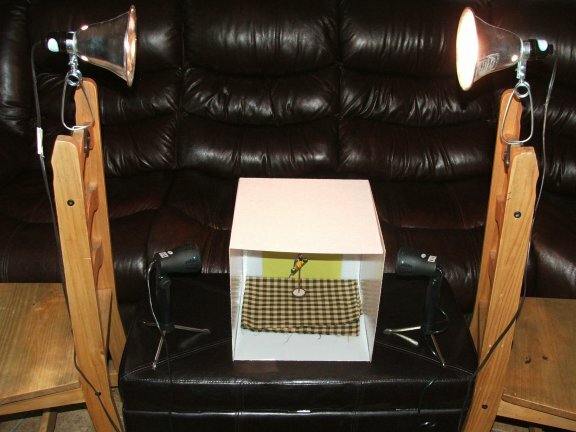 Here is my set up, you will need to set up your box & lights and and find out what works for you. Notice the lights! They are not pointing directly at the box. Doing so will wash out your miniatures and make a bad picture. Turn off all other lights in your room when taking pictures. Backgrounds are critical when taking pictures of miniatures. Earth tones are generally better than colors such as black, white, red, or blue. These colors will confuse the brain of cameras and have a hard time getting a focused picture, as well as a true color of your miniature. Some great backgrounds I recommend would be Memory book paper, felt and some fabrics. Work with your camera, find out what works best for you. Stephanie Brown was awarded IGMA Artist status this year in the Animal, Taxidermy category in 2008; a new category for IGMA. She enjoys sculpting wildlife, pets, and plants along with whimsical as well as fantasy creations. Stephanie is a valued member of the CDHM Forum. Visit the Galleries today. Reproduced with permission from Stephanie Brown. All photographs and text appearing in this tutorial are the exclusive property of Stephanie Brown. Permission is explicitly denied for any republication of text or photographs in this article without the prior express written consent of the author.